During the last nine months or so, none of our boxes have made it to the recycling center. We will need them all for storing the stuff we’re not selling or bringing along. 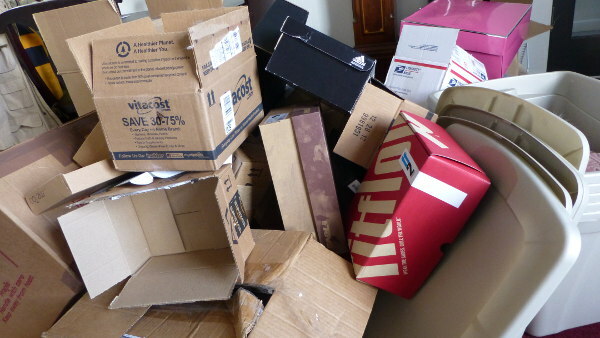 Several stacks worth of free boxes – previously used – have been growing around the apartment. For a while, we couldn’t even find the office light switch. The collection got a huge boost when an eyelash salon moved to our building. Kimmi (“Miss Knockout”) gave us boxes that had held furniture, supplies, rugs – even appliances. What a rich collection! Now that she’s established, her deliveries of fake eyelashes and lipsticks come in boxes that are way too small for our purposes. Christmas was quite a boon to the box collection, and of course, expat preparation has necessitated a flurry of online shopping. Barely a day goes by that Tom or I don’t push the Amazon One-Click button to bring in a money belt, the perfect camera, an inflatable travel pillow, comfy shoes, quick-dry underwear — always ordered one item at a time. We get more boxes that way, and none have been abandoned. We started to pack a week ago. We are no longer flinging the empty boxes from room to room in order to find the light switch or the washing machine. Flinging is no longer an option, as empty boxes are turning into full ones. We just hope we won’t have to – gulp! – buy any. Genius idea! Thanks for your support. We are entering the thick of it now, clutching our tequila.